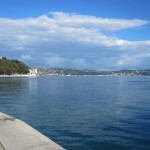 My trip was to be a long weekend with three complete days in the Istanbul area. 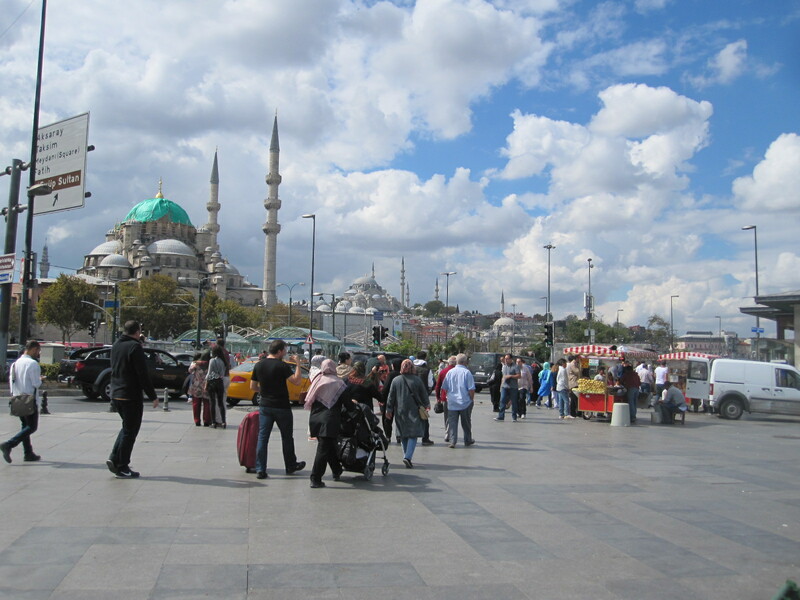 For me Istanbul has always conjured up an image of a dramatic and exciting city at the junction of Europe and Asia, thronging with secret agents and spies. This was reinforced by Wikipedia, which lists 89 films and hundreds of books as having been at least partly set in the city. 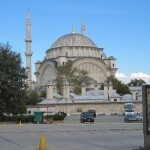 It has long been of great political and religious significance as a leading base of the Ottoman Empire, to say nothing of the improbable fact that there are four car museums in the area. For the first night I reserved a room at the Hilton Garden Inn Atatürk hotel, which was about two miles from the airport, and I had hoped to arrive before dark. By the time I got to the car rental office it was dark, which makes it more difficult to check the car for defects. The booking was made through a broker highly recommended by Which? called Zest Car Rental, who offer a selection of providers at various prices. I have never believed in stinting in this respect because I think it is why so many people have trouble, but in this case I chose a Hyundai Accent from one of the cheaper local firms called Erboy. They always reserve the right to substitute what they consider to be an equivalent car and I finished up with an Opel Corsa (Vauxhall Corsa at home), a car that I particularly dislike. An immediate problem was that the driver's seat was too low and not adjustable for height, which I solved by making a cushion out of the spare clothes which were in a strong plastic bag in my case. Far from ideal, but I was not going to be driving any great distance and have never bothered much about ironing anyway. After studying several maps of Istanbul I realised that the local road system is extremely complicated, with a vast number of one way streets and mini Spaghetti Junctions everywhere. The Turkish language is not at all easy, and street names are hard for a non-speaker to remember. As usual I had street level maps in my tablet and phone, which proved to be absolutely indispensable, as they can be expanded to show junction layouts in great detail. Even so I managed to get lost in the two miles from the airport to the Hilton Garden Inn Atatürk Hotel. The next morning I could fully appreciate the magnificent view from my room, which was on the 14th floor. Somehow I had imagined that Istanbul would be flat, but in fact it was built on a range of hills, divided by two major waterways. 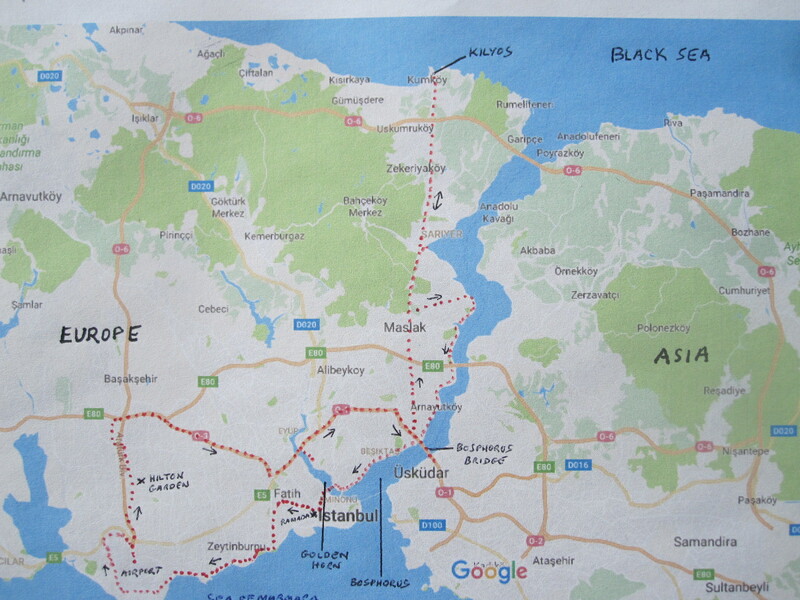 One is a wide estuary called the Golden Horn leading into the Bosphorus Strait, which runs northwards from the Sea of Marmara through to the Black Sea, thereby separating Europe from Asia (see map). About two thirds of the city is in Europe and one third in Asia, the total population being over 14 million, which is greater than any other city in Europe. 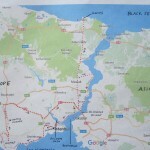 Despite its size, it is not the capital of Turkey, that honour going to Ankara, over 200 miles away. My first port of call was to be the Mehmet Arsay Classic Car Collection, which after a great deal of research I had worked out was on an industrial estate in the north of the city, but I had serious doubts whether it still existed. It appeared to be at the end of a long narrow shopping street where I stopped at a café for breakfast because I could not afford the hotel’s prices. No one in the café spoke English and I finished up with a pastry filled with cold meat instead of the jam that I expected. Just like France. The industrial estate was large and modern with no signs and the man in the gatehouse did not speak English. However, when I showed him the address of the museum there was a glimmer of understanding and after speaking to someone on the phone he directed me to the far end of the estate road, where I could just see a man waving his arms. He led me to the museum building, which only had a tiny nameplate on it and guess what – he spoke no English at all, but was clearly passionate about the exhibits in his charge. They were one man’s personal collection, about eighty cars, fifty per cent of them American and all in absolutely perfect condition. There was no charge for the visit, and despite the language problem the curator and I seemed to part as very good friends, typical of the camaraderie that exists in the classic car world. Golden Horn. 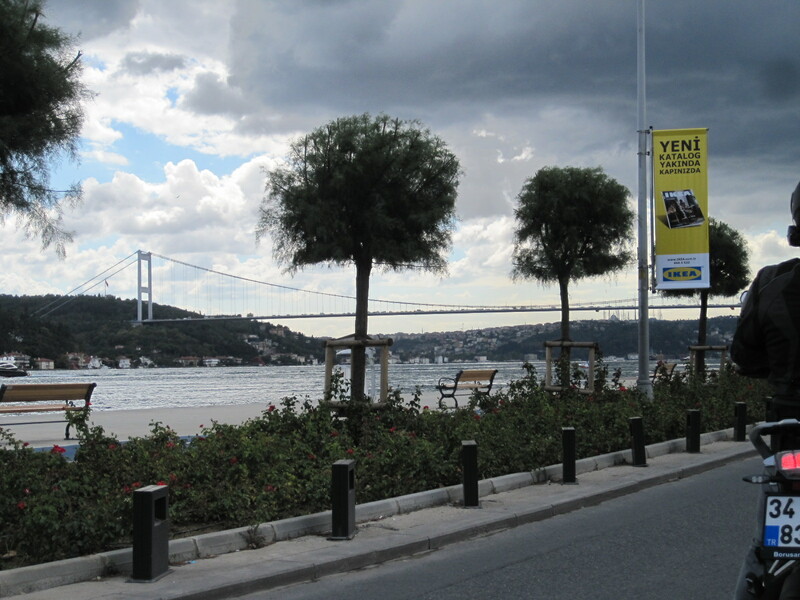 Much of the route was on an elevated motorway, which afforded marvelous views of Istanbul’s astonishing skyline with mosques and other notable buildings in all directions. The bridge over the estuary consisted of several separate carriageways, and I shall never know how I managed to get into the correct one for the slip road the other side, but somehow it worked out. The traffic was fairly heavy and the general standard of driving fell well short of that in Britain, although I have seen much worse elsewhere. Apart from a large number of motor vehicles, including some Turkish cars, the museum had trains, ships and aircraft. In the main car hall was a photographer taking pictures of a just married couple still in their wedding finery. The bride was draped in various poses across the cars and the absence of any other members of the wedding party suggested that it was a staged photographic session for some publicity purpose. 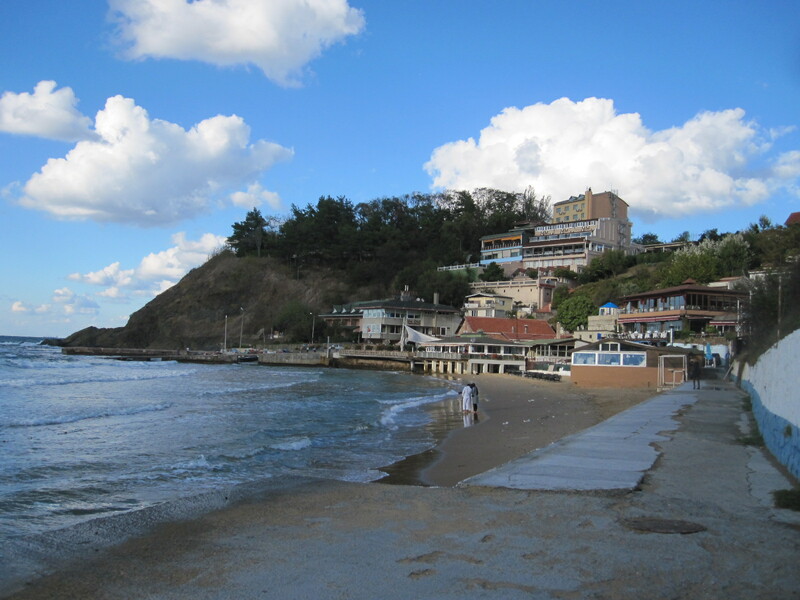 My night stop was to be in a small resort called Kilyos on the Black Sea, about 17 miles north of Istanbul. This might not sound very far, but the route was quite complicated and I expected it to be slow going. From the museum I planned to drive about 4 miles eastwards on the motorway and then turn northwards and take an ordinary road through a town called Maslak. Unfortunately I missed the turning on the motorway for Maslak, and found myself heading inextricably at 70mph for the famous Bosphorus Bridge, the main road link between Europe and Asia. The bridge has an electronic toll system, and the penalties for non-payment are said to be quite severe. I had asked the people in the car hire office about this, but due the language problem I was still not clear about the procedure, and whether the car had a transponder. Anyway, as I hurtled into Asia there was nothing I could do but take the first exit, which led me round in a circle and back on to the bridge in the opposite direction! This must have been one of the briefest stays in Asia that anyone has ever had, although there were some good views from the bridge. At the time of writing no one from Interpol has knocked on my door to demand payment. As expected, the route through Maslak up to a town called Sariyer was slow going, but once clear of the built-up area the scenery was quite pleasant and I reached Kilyos late in the afternoon. The Yuva Hotel was not very good, and had few other guests. The whole resort was extremely quiet and I think there were more restaurants than visitors. 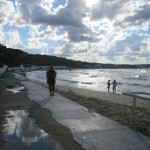 The short promenade and beach area had a run down appearance with cracked concrete and dilapidated buildings, which suggested a long term decline rather than just the end of season effect. 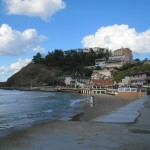 The plan for the Saturday was to drive back to Istanbul along the west bank of the Bosphorus, calling in at a car museum just south of Sariyer, and reaching the Ramada Grand Bazaar Hotel in the middle of the city by early afternoon in time to go to the Bazaar, which is not open on Sundays. The museum was absolutely superb, in the form of a traditional American diner, with dozens of working neon signs, petrol pumps and a collection of iconic cars, all in perfect condition. Everything was spotlessly clean, and the only member of staff who spoke English told me that it was, again, all one man’s property. It was quite obscurely situated in the middle of a maze of narrow suburban streets and has limited opening hours, but there were a few other visitors. 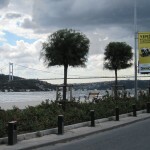 The road alongside the Bosphorus passed through a number of busy resorts and under the Bosphorus Bridge, with a scenic backdrop the other side of the strait. Eventually and inevitably I hit the city centre traffic on the approach to the old bridge over the Golden Horn and it became very slow going. All the books advise against driving in central Istanbul but I got to within a short distance of the Ramada without too much trouble. Then the problems started. The hotel was in the middle of a network of mainly narrow one-way streets, some of which were blocked off with rising bollards. The streets that I could get into were obstructed by vehicles loading and unloading, with rampant double-parking everywhere. After about an hour I managed to park about 200 yards from the hotel and asked a taxi driver how I could get to it. He said “You can’t, the streets are blocked off from 10.00am to 8.00pm. We can’t even get through with taxis”. It was hard to believe such idiocy, but when I walked to the hotel they confirmed what he had said. On the booking form the hotel claimed to have “private parking on a site nearby”, which is the reason why I chose it. It turned out that this parking was also within the closed off area, and they sent a man out with me to find another car park. After about a further hour of struggling around the congested streets we gave up and I had to leave the car in the street until 8pm. The hotel people were embarrassed about this situation and gave me an upgraded room, free breakfasts, and free parking (when I could get to it) as compensation. 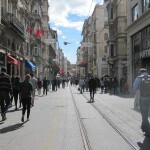 After all that I still had time to walk to the Grand Bazaar, which was open until 7pm. The Grand Bazaar dates from 1455 and is one of the oldest and largest covered markets in the world, incorporating 61 streets and over 4000 shops. It receives between 250,000 and 400,000 visitors daily and in 2014 was listed as number one among the world’s most visited tourist attractions. 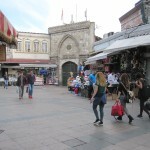 As it is within the old walled city it can only be entered through massive gates that are closed outside trading hours. 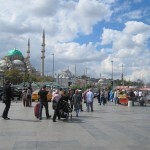 The streets are narrow and pedestrianized with some hills actually inside the Bazaar. All the usual merchants are there, offering food, clothes, and household goods, with areas devoted to jewellery, silver and rugs etc. The famous quality brand names are in evidence, but at prices that are not on the same planet as those for similar articles in London or Paris, and it is only possible to draw one conclusion. Obviously there are a vast number of shops selling the same things, and competition is intense, with haggling being an essential part of the purchasing experience. Some distance away is a separate Spice Bazaar that I did not get to. It was dark when I got back to the hotel and the bollards were down, so someone came with me to collect the car and put it in the proper underground car park nearby, where I left it for two nights. 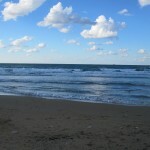 I had reserved the next day, Sunday, for sightseeing on foot. 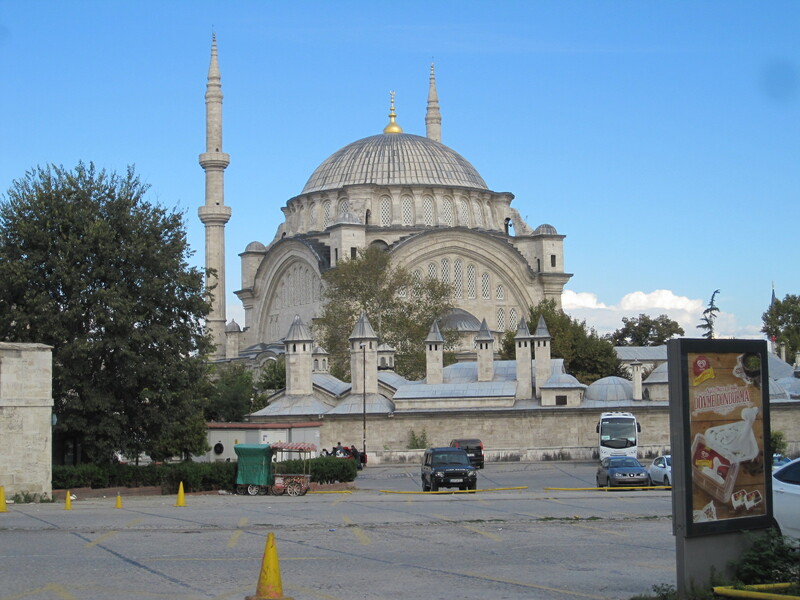 Fortunately the weather was perfect as I walked along the main tram route to the district called Sultanamet which contains three of the most important sights including the Blue Mosque, which is not the largest in Istanbul, but is said to be the most photogenic. Everywhere you look there are mosques, and the skyline is dominated by them, but I was astonished to learn that there are actually over 3000 in the city, though not all are still active. 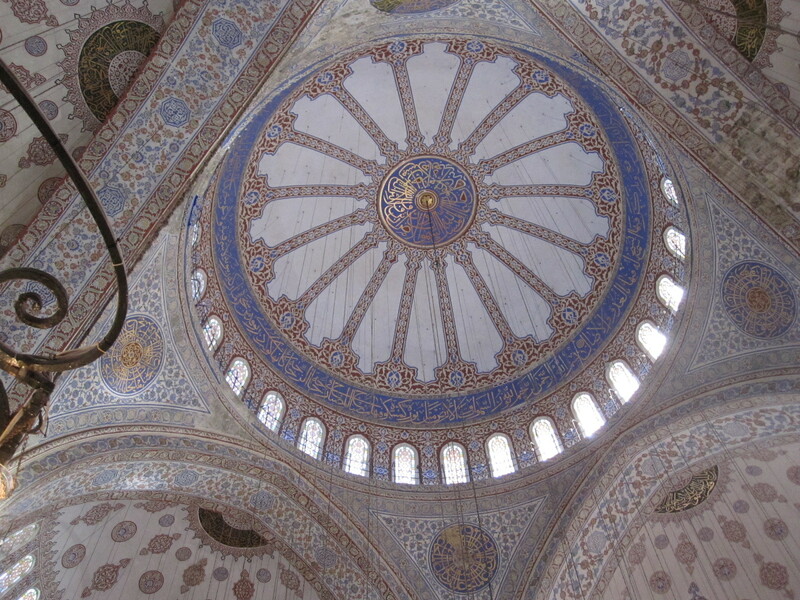 Many mosques are not open to non-Muslims, and the Blue Mosque was the first one I had ever been into. Subject to certain rules regarding dress (e.g. no shorts or sleeveless tops, shoes must be taken off) it is open to everyone. It is one of the most popular tourist attractions, and I was surprised to find that at 10.00am on Sunday morning there was no queue, which might be a consequence of foreigners being deterred by the coup. Carrying my shoes in a polythene bag (provided, with no 5p charge! ), I entered through a side door reserved for visitors. 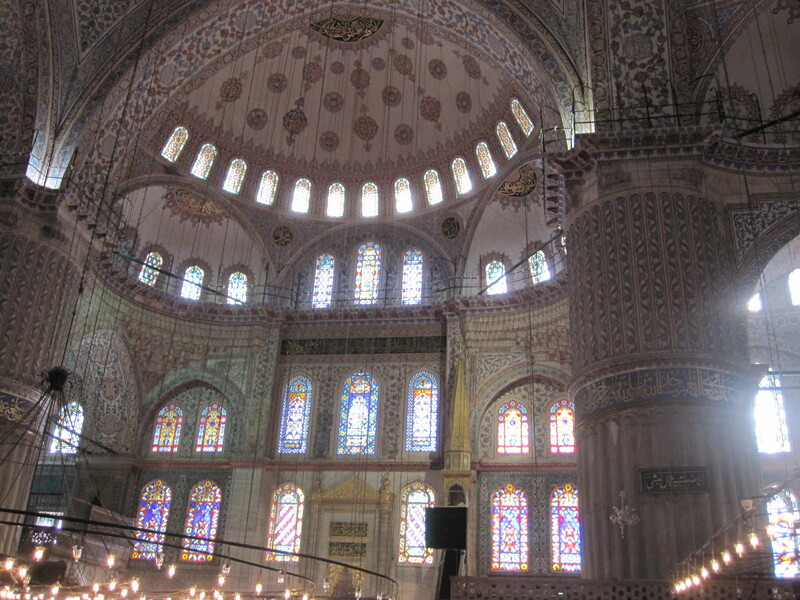 The interior was beautiful without being extravagant or opulent in the way that many great buildings are, being decorated with a vast number of tiny tiles, predominantly having a bluish tint, hence the name. 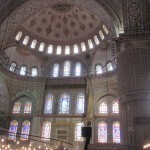 Stained glass windows were very much in evidence, reaching high up towards the dome, which was lined with the tiny tiles. As always in such buildings, one can only wonder at how people carried out such labour-intensive work in what must have been dangerous and difficult conditions. The floor was carpeted and there was very little furniture, appropriate for the style of prayer in the Muslim faith. Photography was allowed and entry was free. 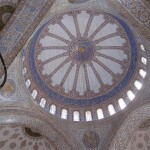 On a par with the Blue Mosque was the next building on my itinerary, the Aya Sofya. Originally built as a church by Emperor Justinian in 537 and converted to a mosque in 1453, it eventually became a museum in 1934. I did not go in, but externally I thought it was just as photogenic as the Blue Mosque. 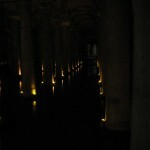 On to the Basilica Cistern, a huge subterranean reservoir built in 532. 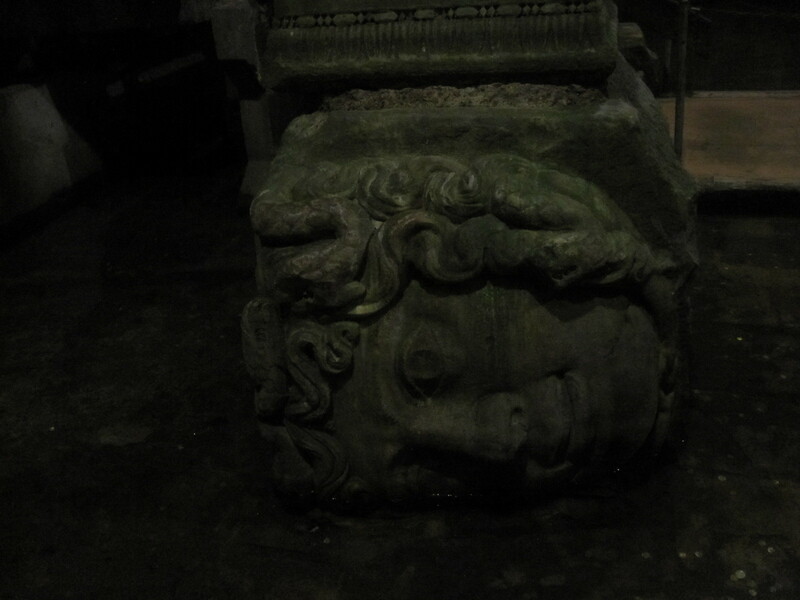 It has 336 stone columns, all 9 metres high, many taken from ruined temples elsewhere and standing in shallow water which is home to carp and goldfish. The whole place is dark with discrete orange lighting and on entering from bright sunlight it is difficult to see anything for a while. 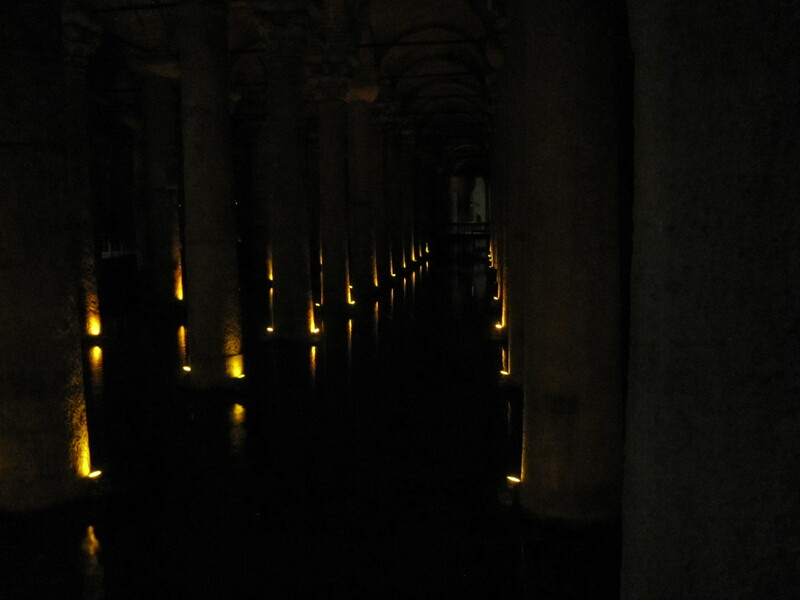 The photographs, taken without flash, give a realistic representation of the light level when seen from the elevated walkways. 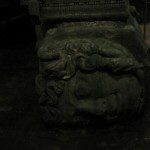 Major items of interest are enormous stone Medusa heads at the foot of two of the columns. They were deliberately placed with one is on its side and the other upside down, although no one knows why. As I walked through the streets towards the waterfront I was accosted several times by men who either asked me where I was from or just addressed me in German. They always started off very chatty, saying that they had friends in Liverpool or somewhere when they realized that I was English, but worked their round to asking me to go to their carpet shop. After a while this becomes very annoying, although it was nothing like as bad as in Morocco or Cuba. 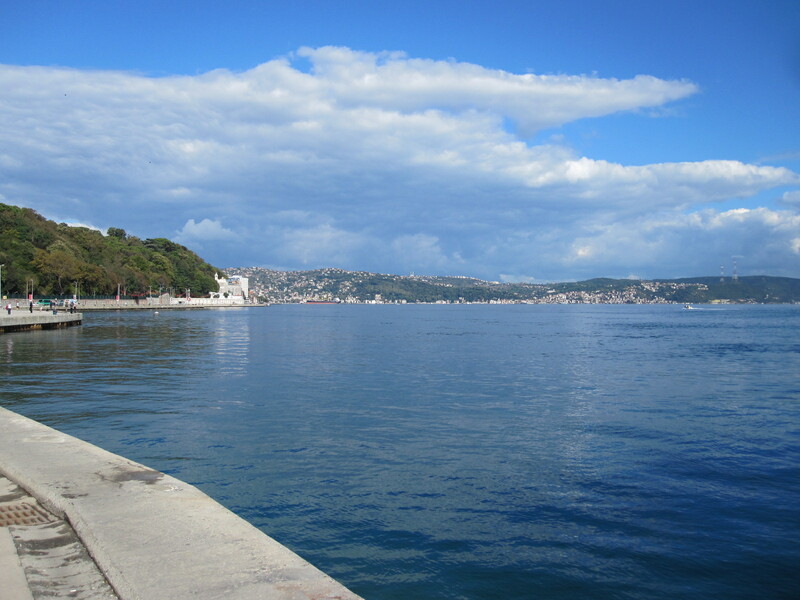 The waterfront, in the area where the Golden Horn runs into the Bosphorus, was exactly the sort of exciting place that I had imagined Istanbul to be. 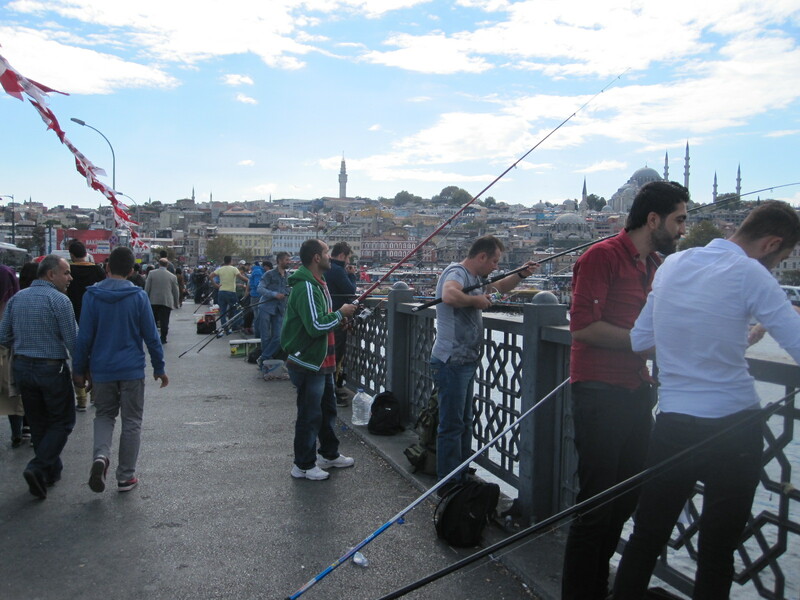 The long quayside was thronging with people, against a backdrop of frantic activity by ferries and river cruisers, mainly connected to various ports on the Golden Horn and the Bosphorus, but some going as far as the coasts of the Black Sea and Sea of Marmara. 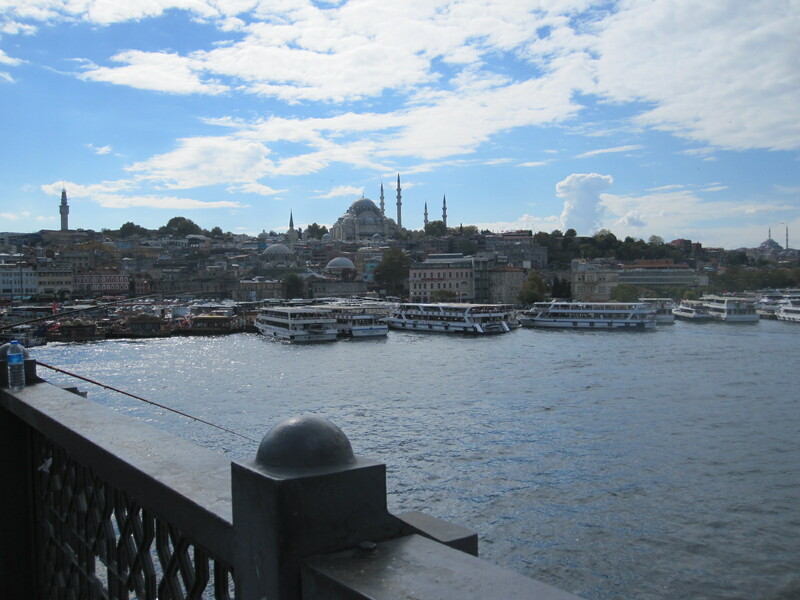 I walked over the Galata Bridge across the Golden Horn to Beyoğlu, the northern part of the city centre. 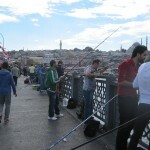 The bridge was lined on both sides with fishermen who, despite the reputed pollution of the local waters, seemed to be doing quite well with their catches. The view from the bridge was superb in all directions, with hillsides covered with densely packed ancient buildings, including innumerable mosques and, of course, that unforgettable skyline. 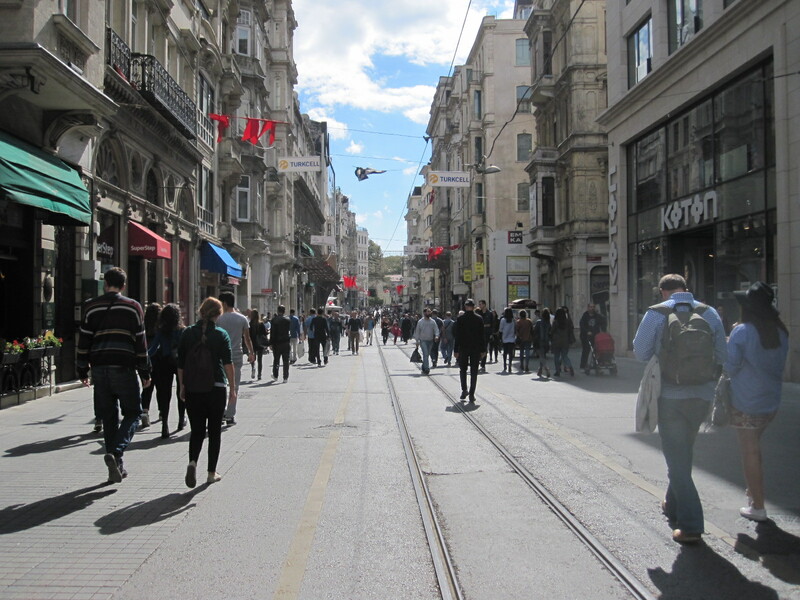 Leading up the steep hill from the bridge is the main street of Beyoğlu, called İstiklal Caddesi, lined with imposing 19th century buildings, many of which are now shops and cafés. This street went on and on, which I simply could not, and eventually I turned back and returned to the waterfront. 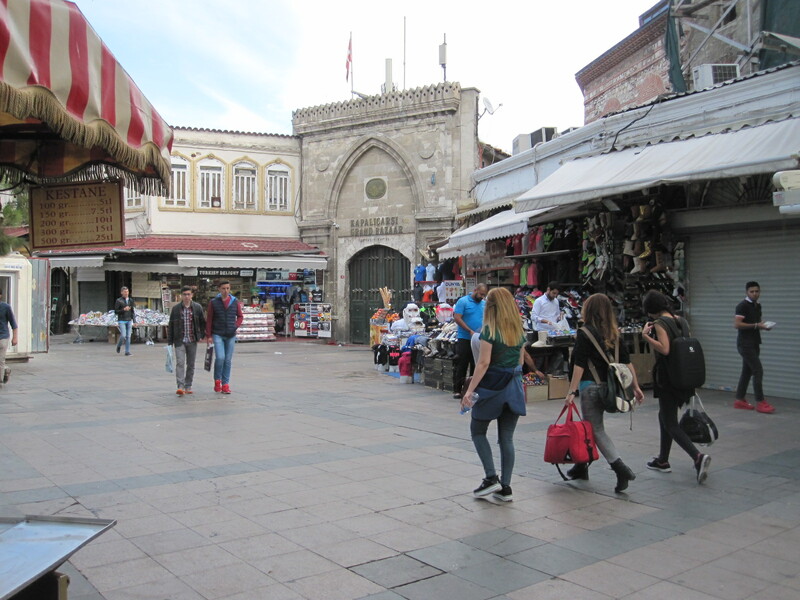 My route back to the hotel took me, perhaps unwisely, through an area of deserted streets past the closed Grand Bazaar, where I could have been mugged with no hope of anyone coming to my defence. It is all too easy to wander into such situations, and I resolved, as I have done many times before, to be more careful in future. 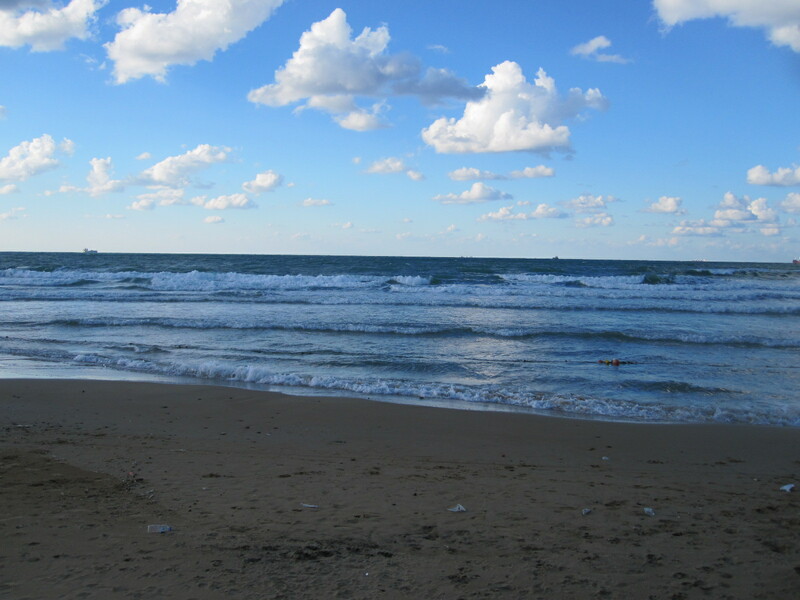 On the way back to the airport the next morning I took the main road along the coast of the Sea of Marmara, with its hectic traffic and empty beaches. Returning the car was a chaotic procedure, with the car park barrier refusing to lift when I arrived, and no one in the Erboy office, but I eventually sorted it out. 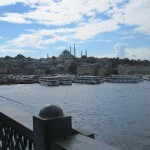 A few points about Istanbul. Public toilets are fairly easy to find, although some are not exactly salubrious. The city centre congestion is dreadful, largely as a result of bad driving and poor traffic management. Light controlled junctions are continually blocked by crossing traffic and double-parking is rife. 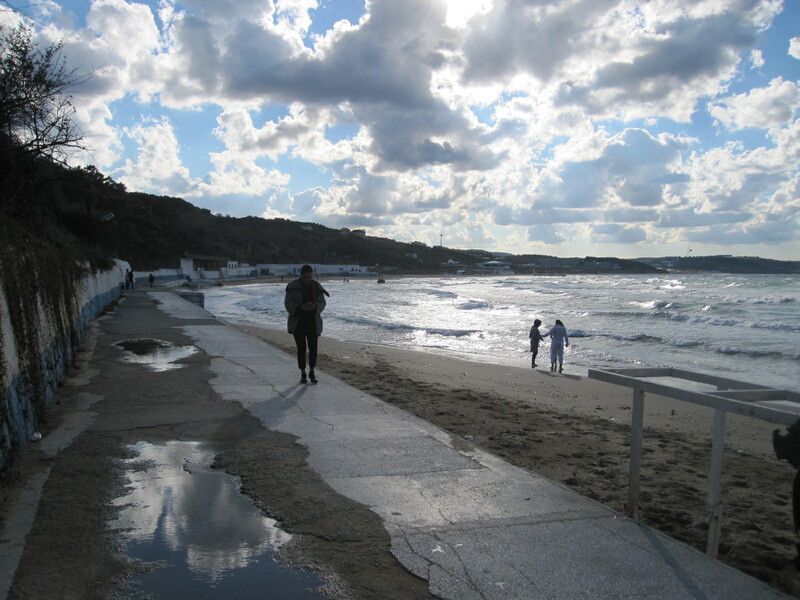 Accommodation and restaurant meals are not particularly cheap and overall I thought it was more expensive than some other southern European countries. Not long after my visit thousands more government employees and many journalists were dismissed, indicating that the country might not be as stable as it appears on the surface.